Long after the girls had left to attend to their afternoon tasks—sewing and spinning and weaving lessons could be taught by any competent woman—Anwen remained in her room and read. She had few books, for they were difficult to find and expensive to acquire. The few she did have, she cherished. She read them often, but only in the privacy of her room where no one would see her doing it. It was another reason she was grateful for the room and the door that kept out the rest of the world when she needed it to. She knew she was reading in order to stop herself from thinking. She didn’t want to deal with the wounded soldier, even in her thoughts. She had no experience dealing with men, especially not angry men. All her life had been spent among women. The alert of the sentry on the tower over the gate forced Anwen to put aside the book. She rose and moved to the window. It was a narrow aperture, but low enough for her to see into the yard, to learn who was about to arrive. Three guards pulled open the heavy wood and iron gates, just in time to allow entry to five men on horses. They thundered into the yard, their cloaks flying and pennants flapping. More of the Duke’s men from Dimilioc, Anwen guessed. They were all large and strong. The horses halted, breathing hard. Slaves ran to gather their bridles and contain them as the men jumped to the ground. As the horses were led away, the men removed riding gauntlets, talking among themselves. One gave a soft call, halting the slaves. He moved over to the horses and lifted a long wooden shaft that had been strapped to the horse’s side. He carried the staff over to the group of soldiers and held it out. The man who took it was the tallest of the group. His hand thrust out, then moved sideways until his palm smacked against the staff and he gripped it. This, then, was Steffan. Anwen pressed her hand to her chest as her heart jumped. She had expected a blind man to look…well, blind. The only other blind person she had ever met was an old woman, whose eyes were milky and skinned with growth that blocked her vision. She had been a wretched creature, shuffling about with her hands out, when she dared move off her stool at all. Steffan, though, was identical to the other men in dress and manner. He had ridden the horse as if he could see. Had he allowed the horse to find its own way, then? He had thick dark hair, as most Britons did. It was unruly, though, with waves and locks that did not lie against his head. His fair skin was tanned as men generally were. His nose was straight, his brows thick and his jaw very square. The chin was strong, too. His neck was thick and strong. There was nothing wrong with his eyes as far as Anwen could tell. They looked perfectly normal, although she was too far away to determine their color. He was even turning his head as if he was looking about the yard. Was he listening, instead? He turned so his gaze—if he could see—was upon the tower itself. For a moment it seemed he was looking directly at Anwen, where she stood behind the window. She stepped back, her heart leaping and her breath shortening. Fright tore through her. How could she contain a powerful man like that, when a whole fort of soldiers could not? Anwen is the least favored companion to Lady Igraine, the Duchess of Cornwall. No man will marry her, for she is old and plain. Instead, she teaches Igraine’s children to read. Steffan of Durnovaria was once a celebrated warrior in the Duke of Cornwall’s army, a friend to Prince Uther, the High King’s brother, and destined for greatness, until a Saxon war hammer stole his sight and destroyed his life. To deflect Steffan’s anger from the warriors around him, Igraine directs him to help Anwen teach her daughters. The assignment brings him no happiness and terrifies Anwen, who has never spoken to a man directly in her life. When the new High King, Uther, meets Igraine for the first time and becomes obsessed with her, Anwen and Steffan are drawn into a web of lies and deceit that could destroy Britain’s fragile peace. Totally caught up by this roller-coaster of action and romance. I loved ‘watching’ the developing rapport between the two main characters. It was the main characters’ relationship and also their interactions with others that made this book another can’t-put-it-down novel in this series! Its an intriguing storyline with political bylines brewing in the background. I’m not one who likes to be too sidetracked into historical or political plot lines or details when there’s a romance blooming but Tracy Cooper-Posey strikes a very sweet balance between the two: engrossing action and storyline to offset the romance! There were surprising twists and dastardly deeds perpetrated by characters I never suspected had it in them! Some of these events were the hard realities of the times but it’s written so well I was swept along for the ride, railing against the fates along with the rest of the characters in the story! There were delightfully unexpected insights into some interesting details of these times, as if I was looking through a magnifying glass into days long-gone-by...small slice-of-life moments that make it all so real. I never expected to thoroughly enjoy books of this historical era so much!! I have previously enjoyed historical romances but the way these are written creates such a feeling of total immersion in the times that when I take a food break from reading I almost expected to have a hunk of bread and some stew served up!! I highly recommend this book but make sure you read this awesome series in order as each book contributes to the whole story. In this next book Pendragon Rises it is not only about a king, a king to be or a king to come; but about two people who are overlooked in society by most. Stefan, a soldier injured and now blind and Awen, a women who has spent her life in the background and the shadows. This is a story how 2 people who are completely different but have both the same values and what they have to do when those values are tested between themselves and the people they care for and respect. Tracy has given us another great book and will keep you wanting to see what is next in this story. A wondrous love story filled with marvelous storytelling and true facts. The author never lets us down. This is the third book in the , "Once and Future Hearts" a series written during the time of King Arthur. A magnificent telling of finding love where least expected; of men and women both strong and weak. A new story told within stories of old, filled with adventure, lust, betrayals, beauty and blood. It takes hold of the reader, makes our hearts beat faster, has us sighing at the wondrous feeling of love, gasping at the disaster that lust brings and the "ohhh" knowledge of whats coming. Pick up this book and read a story that will immerse you within the legends of old while giving you a new view of circumstances that you'd swear was always there but somehow just missed it. Pendragon rises is the third installment in the Once and future hearts series. This is the story of Anwen and Steffen and my favourite so far because, not only is the love story compelling but we've reached the point where the characters are all well-known to us. I really, really love Tracy's strong characters, especially women that, in one way or another are always key to the story on their own, not dependingon a male character, in this case Anwen, as plain as she thinks she is. What I like most about this story is the development of the characters. For example Steffen didn't remain his soldier persona but evolved and put some profound thoughts out there. Another great story by Tracy. Anwen and Steffan make an unlikely pair and I really enjoyed reading their story. The magic and mystery of the medieval times makes this an exciting read. This is a great story filled with action and intrigue. And that goes double if you are a Mary Stewart fan. 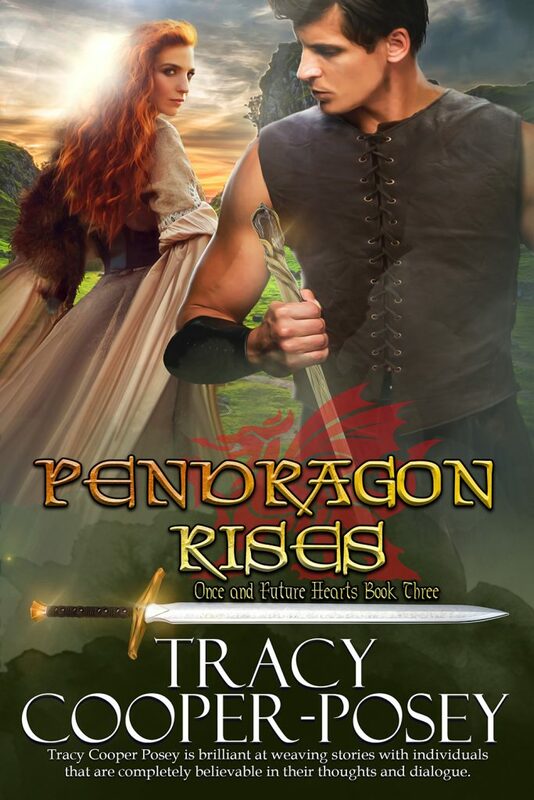 Tracy puts together a wonderful story that parallels the Arthurian legends and history of that time while keeping the characters relatable and realistic. A definite read! Having just finished this book, I found it to be a very interesting & describable story, with a lot of tugs into history we would all have not known about. I loved this story from start to finish, but the best thing about it for me was Steffen & Anwen. The most unlikely love story to unfold amongst all the fighting. A couple who had to fight everything against all the odds. As well as do everything else they had to do to keep alive & make a living in them days. Plus you also has a Queen to one king doing things she shouldn't with another king. So much like nowadays, even I couldn't believe that one but there you go. Merlin was privy to it all too, but then, when wasn't he? Keep a magician close & he'll keep you safe. I've put 5 starts, because as per & I've not read it yet, Tracy's writing leads me to believe that it will deserve the 5 starts. Looks like I'm not the only one in a hurry to read it either. Can't wait again.